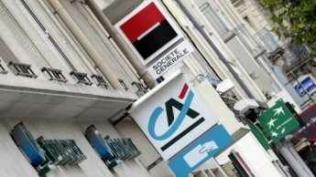 AP - The Moody’s rating agency downgraded three leading French banks on Friday, saying that the spiraling debt crisis in Europe was making it hard for them to get loans and that the situation may get worse. Banks are at the front-line of the debt crisis raging across the 17-country eurozone that has threatened to drag the global economy back into recession. It took action a day after a regulator said European banks have to raise about €115 billion ($154 billion) – more than expected – to meet a new standard meant to shore up the lenders against market turmoil. European banks have billions of euros of risky government bonds on their books, and investors are increasingly concerned the lenders won’t be able weather all of the expected losses on those loans. That has led many banks to resist lending to one another, making it difficult for them to secure the overnight loans they need to run their daily operations, as well as other funding. Moody’s cited those difficulties in its ratings decisions. The agency also noted that the banks continue to carry a substantial amount of risky debt on their books. Credit Agricole even owns a Greek subsidiary. Greek banks, which own lots of their government’s debt, were hit particularly hard by an agreement to slash the value of those bonds. Societe Generale also carries a lot of Greek bonds as well as Italian ones, while BNP has significant exposure to Italy. While all three of the banks – some of the largest in Europe – have begun to get rid of that debt, Moody’s said that exposes them to significant losses. “Given that many other banks in Europe are engaged in similar programmes, there is a mounting risk that the resulting asset sales could be detrimental for capital,” the agency said. BNP’s overall strength rating fell two notches to C; Societe Generale’s moved down the same amount to C-. Credit Agricole dropped one notch to C-. C-ratings fall in the middle of the Moody’s scale, which goes from A to E.
BNP and Credit Agricole’s long-term debt ratings were both reduced to Aa3 – which means they remain high quality. Societe Generale’s is now A1, a notch below the others. « Προηγούμενο Le livre, un produit de première nécessité ?